My 1992 Jawa “Jive”, two speed, kick start, model 225. I bought this off ebay with only 305 Km on the clock. It is a restricted version made for the Netherlands market, where the yellow plate on the front mudguard was used as an identification marker. A yellow plate identifies it as a (normal) moped - restricted to 45 km/h, helmet required. An orange plate was used to identify light mopeds - 25 km/h max., no helmet needed. These plates are no longer used, replaced by yellow or blue rear registration plates respectively. I’ve no idea how this ended up in the UK. This is badged as a Jive but all the UK literature on these models show the Jive as a single speed pedal start. This kick start model should be a Jazz, unless this model was badged as a Jive just for Holland? I’ve done a bit of restoration - refreshing the paint work, the white in particular, some of which had yellowed badly, and generally cleaning and tidying it whilst keeping it completely original. The only changes from original that I have made is to remove the 28 mph restriction and add a horn and stop light, required for the UK MoT test, and a mirror. More information on these additions is in my ‘Electrics’ data sheet, below. Below are some data sheets and articles on various aspects of mopeds, some with information on tuning. Some of the articles are by me and some are by others, but in all cases you are advised to seek professional advise before doing any modifications to your moped unless you are very sure that you know what you are doing. I can take no responsibility if it all goes horribly wrong. I regularly get asked about availability of spares and about the value of mopeds. I have prepared this data sheet that tries to give some answers. This data sheet has full details of the Babetta electronic ignition systems and the various electronic units used, including how to swap to later, better versions. Full description of the lighting and auxiliary equipment and generator fitted to the Babetta mopeds and some notes on modifications. Information and wiring diagram for direction indicators. See also the April‘79 CMR article on the “manuals - 207 literature” page showing a factory fitted version. A table of recomended spark plug types for most models with equivalent grades from various manufacturers. A data sheet with some detail information about gear and engine oil types for use in our moped gearboxes. Some information about the U.K. MoT annual test and how it applies to mopeds and lightweight motorcycles. A link to “Fred’s Guide” an excellent article with loads of information about moped repair on the Moped Riders Association web site. Click this for a printable pdf. An article from USA magazine Popular Mechanics from Oct.‘77 giving a guide to general moped servicing. I wouldn’t take any notice of their oil mix suggestion. 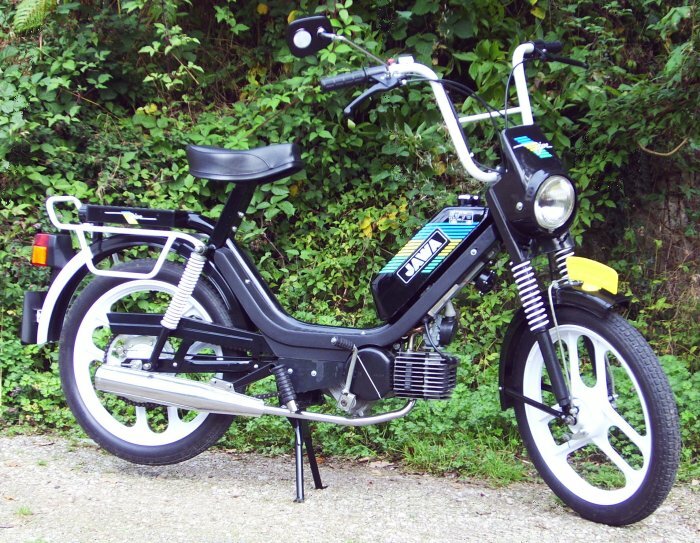 A link to an article on the Moped Army web site about tuning Jawa/Babetta model 207 and 210 mopeds. Remember - modify at your own risk. Some information about UK vehicle registration numbers - the codes for year letters from 1962 to 2001, and numbers and region codes from 2001 onwards. An article from Jawa-CZ Owners Club club member, Andy Read, about how he built a Mustang engined Babetta model 210 and his road tests between models 210 & 225. Brown buttons are my own documents, green buttons are external links - in case you wondered. This isn’t just thrown together you know!